Happy Birthdays, Ted and Joe! 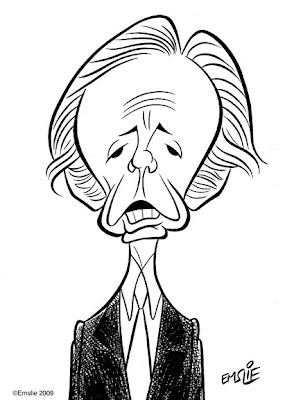 Admittedly, I have somewhat mixed feelings about Senator Joe Lieberman, who celebrates his birthday on Tuesday. Though a Democrat, Joe also seems to have one foot firmly planted in the Republican camp, being somewhat hawkish in matters of defense and foreign policy. Still, I do respect him for speaking his mind and voting accordingly, as I don't believe anybody should slavishly adhere to the party line on every issue. Well, What Ju'no - It's Ellen Page! In just a short time from now the Academy Awards is about to begin. I'll be tuning in as is my annual ritual, of course! 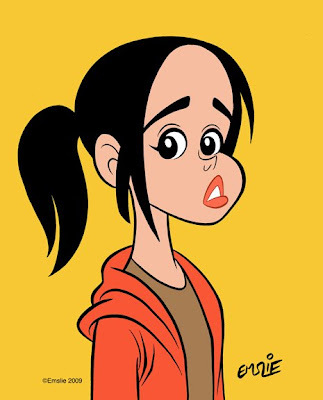 Though I'm afraid I have no caricatures of any of this year's nominees to post, I will instead offer up this one I did of last year's nominee for Best Actress, Ellen Page as "Juno". This was drawn just a couple days ago in honour of Miss Page's birthday which was yesterday. Such a cute kid! Yep, today I hit 49, and so now the countdown is on to the big five-0 next year. I must admit that's a scary thought indeed. On the brighter side, however, Barack Obama has made the journey up here to Canada today to help me celebrate my birthday. In fact, here's a photo of me and Barack just taken this morning before he headed off to Ottawa for a dull discussion with our Prime Minister Harper. 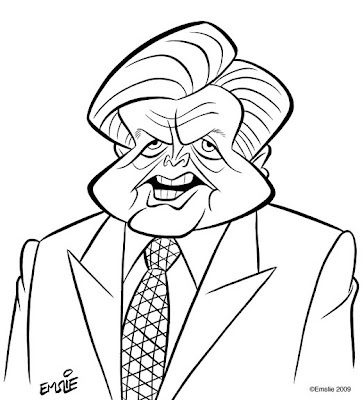 Oh, the other fellow in the photo is John McCain, whom you may recall lost out to Barack in the recent U.S. election. 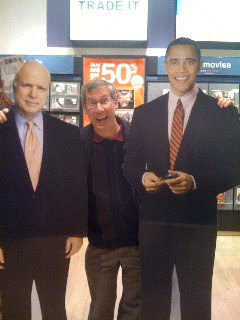 John's been kind of down in the dumps since then, so Barack graciously invited him along to join in my birthday celebration. Sorry for the photo being so small, but it was taken on John's Polaroid One Step. And it also happens to be the birthday of actor, Lee Marvin, who would have celebrated turning 85 this year if it weren't for the sad fact he left us a few years ago due to his celebrating maybe a little too hard all his life! 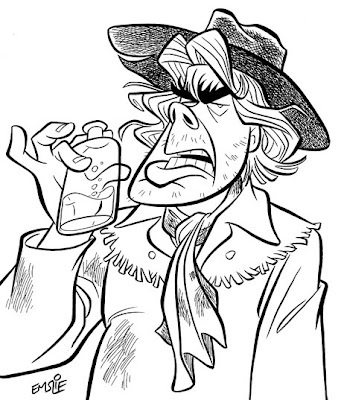 But in honour of this crazy rascal, here is my caricature of Lee Marvin in his Oscar winning role as the drunken, washed up gunfighter, "Kid Shelleen", from the 1965 film, "Cat Ballou". Actually, I just watched "Cat Ballou" again a couple of nights ago so I could draw this, and it really is a fun film. Jane Fonda is just so young and pretty as the title character, and it also features a rare bigscreen appearance by one of my favourite singers, Nat King Cole, playing one of two wandering minstrels (along with Stubby Kaye) who narrate parts of the story in song. Here is a montage of scenes that somebody had cobbled together on YouTube that pay tribute to Lee Marvin as Kid Shelleen. The shot of the drunken Shelleen leaning up against the wall astride his equally drunken horse is priceless!